I ordered the Sync 3 upgrade for my 2015 C-Max Energi when the Sync 2 system bit it. I was a little apprehensive about dropping so much money on this part, but based on reviews went ahead. It shipped quickly and came in a well-packed box so I was confident it had been taken care of during shipping. The instructions included with the part(s) were extremely helpful and easy to follow, and once installed the part seems to be working really well. I can't believe Ford hasn't done this upgrade on their own, but I'm so thankful that the folks at 4DTech made it possible for me to replace my faulty system with this upgraded version. Don't take your Ford to a dealer to upgrade your Sync system. If you can make coffee you can replace this part in your car. It is as easy as they say (at least for my car). The only trouble was getting the old plug out from the console USB. My car has that part inside a very small (C-Max) compartment with very little slack to work with. The videos on Youtube are fantastic. It really helps to know where the dashboard snaps apart, etc. 4Dtech sent the unit and parts in the time I requested (I opted for the cheaper shipping). It was fun to watch it hop several stops to get to CA. I have to read up a little more to see if there is something I missed about the Modem number, which is not listed where the VIN is listed on the screen settings. The SYNC 2 unit showed that. I only am concerned because of software updates and the Ford websites which track the service and "USED TO" be an awesome app which functionality was lost when the app no longer worked with my phone's app. I also wished Ford would have kept the customizable wallpaper (My Dog's photo) feature. Oh well, I like it and look forward to the ease of navigation. I could have used the Car Play for Maps, but I figured if I am spending that much money, just get the navigation in case the phone is not available. Thanks for the great service. I suppose I will send back the SYNC 2 or check for any better offers for the fully functional SYNC 2 unit. Love being able to replace the awful Sync 2 on my 2013 Ford C-MAX Energi with Sync 3 with Apple CarPlay. While Sync 2 crashed and worked terribly, Sync 3 works quite well and Apple CarPlay is terrific! I had my independent mechanic install it and they had no trouble. (I'm not a DIY person.) It was well worth the money. The unit was shipped very quickly. I'm very satisfied. Before ordering I had several questions which were answered promptly and in detail. After ordering, the kit arrived quickly and installation went smoothly (took about 40 minutes). Operation of the new Sync 3 system is quite good and all of the car's older features (backup camera, climate controls, Sirius, etc) work with no problems. I am very happy with the new product and with 4D Tech customer support and overall interactions. They have done an excellent job of programming the system for the older 2013 model and providing a true turn-key upgrade kit. Overall system response quite superior to MyTouch and also much more intuitive and easier to use. This upgrade is so much faster than Ford mytouch. 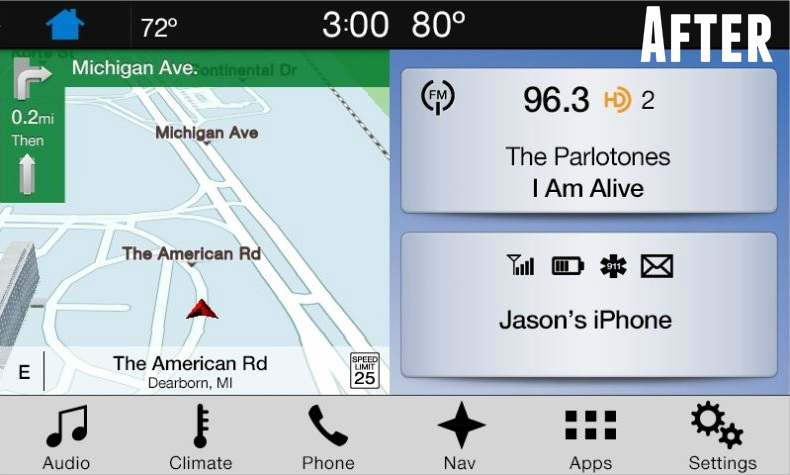 If a turn is missed the nav system has a new solution before going past the intersection. The inputting of information is so much better than the old system. It was pricey but I’m very happy with Sync3! Installation was almost to easy. I placed my order this morning at 7:30 and at 8:00 I received an email stating that my order had shipped. I know that the package is still at the facility but these folks accepted my order, made the necessary programming to my APIM and boxed the order in less than a half an hour. Very impressive so far. 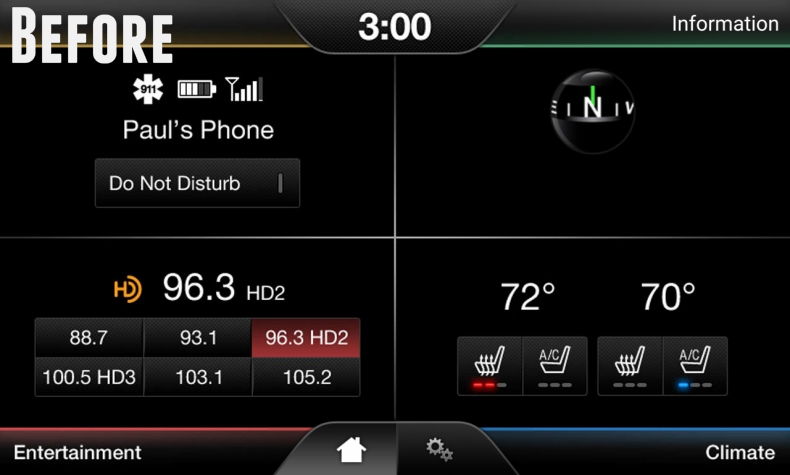 (Side note) when I bought my c-max almost two years ago I added the Nav system to my sync2 system. This was from a different company. I looked going back with the same company but their warranty was 90 days whereas 4DTech is one year. I also added a backup camera to my old system and 4DTech programmed my new APIM to turn this feature on. I did buy their wiring harness but in going with these folks I saved $200.00. Nice start so far. Updates to follow.